Anthropomorphism fails as an explanation for the many-armed divine forms described in the Vedic literature. When I joined the Hare Krishna movement, something in Srila Prabhupada’s books intrigued me: God’s unlimited nature went beyond merely having innumerable forms; these forms, I was amazed to learn, often have numerous arms as well. India’s wisdom texts, in fact, describe a wonderland of beatific multiarmed beings. There is four-armed Vishnu and His consort, eight-armed Lakshmi; the ten-armed Goddess Kali; and an astoundingly ferocious, breathtakingly beautiful, thousand-armed, lion-headed Deity named Nrisimha. All these and many more reside in a multidimensional transcendent realm that the tradition says is our real home, the realm of Godhead, the abode of our heart’s delight. Why, I wondered, do God or His expansions need multiple hands? Won’t two do the trick? I thought of the old song “He's Got the Whole World in His Hands.” Yes, I thought, He’s got the whole world in His hands – and maybe, as this tradition says, He's got more than two. After all, why should God conform to human physiognomy? If He does, might He not also then conform to human limitation? Why try to make God like us? The Greek philosopher Xenophanes spoke of religion’s Deities as a form of projection. He said we envision God in human terms because we are human. Had we been plants or animals and able to think deeply about the nature of God, we would likely have envisioned Him as a plant or an animal. The Vedic conception can’t be accused of that. There we find the supreme divinity manifesting Himself in all species of life – as a boar, as a fish, as a tortoise, even as a man-lion. So Vedic conceptions of God are not simply a projection of our own form. Thus we can counter Xenophanes as follows: The Vedic conception of God is not manmade, or at least it can’t be accused as such for the usual reasons, for it’s a conception that is not constricted or defined by the human form. The way I see it, an extension of this idea is found in the multiplicity of arms under discussion – the Vedic conception of Deity is not limited to our usual two-armed anatomy. But, Still, Why All the Hands? Usually, each form of God holds in His hands some objects that symbolize or represent the various qualities of that particular Deity. The same is often true of other divine personalities as well. Sometimes their hands are empty, but the position of the fingers and the palms signify their mood and character. For example, traditional Bharata Natyam hand gestures, derived from the Natya-shastra, often give information: If the dancer's fingers point toward the ground, it means this particular divinity is of a charitable disposition; if they point upward, it means this deity is in the mood of a protector. These gestures, also known as mudras, indicate a given deity’s individual powers and differentiate one from the other. The same Purana also explains that Vishnu's arms symbolize the four aims (purusharthas) of human life: (a) duty and virtue (dharma); (b) the pursuit of material goods, wealth, and success (artha); (c) pleasure, sexuality, and sense enjoyment (kama); and (d) liberation (moksha), the chief form of which is not simply going to heaven but developing love for God. This is the real goal of human existence. Most importantly, Lord Vishnu holds implements in His hands that tell us much about His person: a conchshell, a discus, a lotus, and a mace. I remembered from my earlier studies in Eastern philosophy that the conch symbolizes creativity and victory; the chakra (or discus) symbolizes the powers of the mind (it is also a weapon with which Vishnu kills demons and slays misconceptions and doubts); the mace, with which He evokes fear in the unrighteous, symbolizes strength; and the lotus symbolizes liberation and the ability to rise beyond the material world. 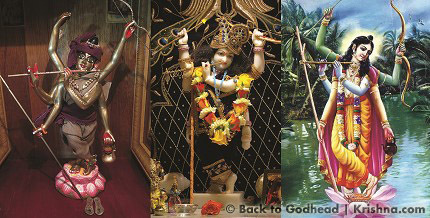 There are innumerable Vishnu expansions of Krishna in the spiritual and material worlds. In His instructions to Sanatana Goswami in the Chaitanya-charitamrita, Lord Chaitanya quotes descriptions from Siddhartha-samhita of twenty-four forms of Vishnu distinguished by the placement of the four symbols in Their four hands. He also lists other Vishnu forms, mentioned in the Hayashirsha Pancaratra. When I think back to my initial interest in God's having multiple arms, I remember that I was particularly attracted to a form called the shad-bhuja-murti, or the six-armed form of Sri Chaitanya Mahaprabhu. While I was a bit taken aback by the awe-inspiring thousand-armed universal form, which Krishna showed Arjuna, and the ferocious ten-armed Nrisimhadeva, I found Mahaprabhu’s six-armed form alluring, and I continue to have a special affection for it to this day. In fact, I collect paintings and photographs of the shad-bhuja-murti, some of which accompany this article. I found that the earliest artistic depiction of this form seems to be in the Oriyan style, painted on the walls of the Jagannatha temple and the Gangamata Math in Jagannath Puri, Orissa. On the southeastern side of the main temple building in Puri, one can see a deity of Sri Chaitanya in His six-armed form. This is because Mahaprabhu revealed this form to both King Prataparudra and his court pandita, Sarvabhauma Bhattacharya, both of whom resided in Puri. Thus the King had this form painted on the outside of the temple tower and on the ceiling of the Nat Mandir, as well as in a room near the southern gate. Sri Chaitanya also showed this form to His intimate associate Nityananda Prabhu, as described in the Chaitanya-charitamrita. 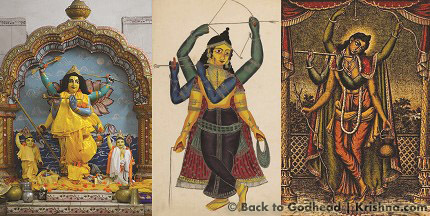 Over the centuries, many artists have depicted this form, but my favorite renderings are the ones done by ISKCON artists that have appeared in Back to Godhead. 1. To Nityananda Prabhu in Srivasa Thakura’s house in Mayapur. This occurred during the Vyasa-puja celebration (worship of Vyasadeva), the day after Mahaprabhu and Nityananda met for the first time. (See Chaitanya-bhagavata, Madhya 5.92; Sri Chaitanya-candrodaya, Act II, text 75; and Chaitanya-charitamrita, Adi 17.12.) Incidentally, according to both the Sri Chaitanya-candrodaya, Act II, text 77, and the Chaitanya-charitamrita reference cited above, Nityananda saw a different version of the six-armed form, with hands holding conch, disc, club, lotus, bow, and flute. This prayer brings to light a little-known dimension of the six-armed form, showing a spiritual connection between the items the Lord holds in His hands, particularly when He descends as Rama, Krishna, and Chaitanya. In conventional Vaishnava discourse, the philosophy of achintya-bhedabheda pertains to the Lord’s essential nature in relation to His energy – it explains how He is both one with and different from everything that emanates from Him. However, in this instance, Srila Bhaktisiddhanta extends its meaning to include the Lord’s many direct manifestations as well. That is to say, He is both one with and different from His incarnations and expansions. The shad-bhuja-murti, Srila Bhaktisiddhanta tells us, is an exhibition of this truth. According to Radhe Govinda Dasa, who is writing a book about shad-bhuja-murti, the threefold form represents maryada-purushottama, lila-purushottama, and prema-purushottama. Purushottama means "Supreme Person." The conclusion is that God can have innumerable hands, one hand, or even no hands. The Vedic literature is replete with descriptions of God’s many divine forms – and their hands. But the important part of God, those same sacred texts tell us, is not His hands at all, but His heart, His love. While His hands may exist in an infinite variety of forms, with diverse symbolism and attributes based on His purpose and meaning, His heart is one. His love for us is single-minded. That is certain. Indeed, Lord Rama’s bow and arrow bring fear to the hearts of the demoniac, while Krishna’s two flute-holding hands inspire devotion in those so inclined. And Sri Chaitanya’s arms? They provide the highest love, prema, for all who adopt the path of Krsna consciousness. Mahaprabhu’s two arms take the devotees beyond all dimensions of the material world and situate them in the embrace of transcendence. *Among the various Bengali versions of Sri Chaitanya-mangala, some omit these verses. I've chosen to include them because they pertain to our understanding of the Lord's six-armed feature. **The six enemies of the world are lust, anger, greed, madness, illusion, and envy. The four goals of life are religiosity, economic development, sense gratification, and liberation. My special thanks to Maha Lakshmi Devi Dasi and Radhe Govinda Dasa for the use of their photos and the fruits of their research. Their Facebook page dedicated to Shad-bhuja, "Sadbhuja – The 6-armed Form of Lord Chaitanya" (https://www.facebook.com/groups/1811067715804556/) was extremely helpful. A guide to the photos. 1. Worshiped by the Mukherjee family in the only private Shad-bhuja temple in Bhubaneswar, Odisha. Installed during the mid-twentieth century by the current worshipers’ grandfather, Nibadan Chandra Mukharjee. 2. Typical Kalighat-style painting from old Kolkata. 1890–1910. The British Museum acquired the original painting in 1993. 3. Kalighat-style painting. Made in Calcutta Art Studio circa 1880. 4. More recent rendition of a painting from the Chore Bagan Art Studio, Kolkata, 1885–1890. 5. Typical patachitra painting from Odisha. Popular Odishan folk art. 6. In the house of Sarvabhauma Bhattacharya (Jagannath Puri). In Mahaprabhu's time, the house was known as Markandeya-sarastata, but since the Shad-bhuja deity was installed by Gangamata Goswamini, the residence is today also known as Gangamata Matha. This bas-relief is at the exact spot where Lord Chaitanya sat hearing Vedanta from Sarvabhauma for seven days, and where He showed him His six-armed form. 8. Dubai, United Arab Emirates. Worshiped by Harinamananda Dasa from Mumbai, India. 9. Butler, Pennsylvania, Worshiped by Maha Lakshmi Devi Dasi. 10. New Jersey. Worshiped by Kishori Radha Devi Dasi. 1. Amritsar, Punjab. Installed within the last decade by Pundrik Goswami from the Radha Ramana temple in Vrindavan and worshiped by his followers. 2. Traditional Kalighat-style painting done by modern young Indian artist Bhaskar Chitrakar from Kolkata, 2014. Visit www.tejasgallery.com. 3. Three-hundred-year-old deity in Ekachakra, West Bengal, the birthplace of Lord Nityananda. He’s in a small temple at Kadam Khandi ghat, where Lord Nityananda discovered Bankima Raya, the deity of Krishna into whom He entered at the end of His manifest pastimes. 4. Hadal Narayanpur, West Bengal. A panel at an old terracotta temple. 5. Sri Gauranga Gaudiya Matha temple, Hullar Ghat, Mayapur. 6. Wall panel in Vrindavan. 8. New Vrindaban, West Virginia. Worshiped by Harinama Devi Dasi. 9. ISKCON Mayapura. Small deity of Madhava in His Shad-bhuja dress, worn every year on the fifteenth day of Candana-yatra in April-May. 10. ISKCON Sofia, Bulgaria. Brought by the late Suhotra Swami in the 1980s. The first Vaishnava deity ever worshiped in Bulgaria. 1. Butler, Pennsylvania. Worshiped by Maha Lakshmi Devi Dasi. 2. ISKCON temple in Hamburg, Germany. 3. BBT painting by artist Yadurani Devi Dasi. 4. Kaligha-style painting, late nineteenth century. Indian Museum, Kolkata. 5. Odishan folk patachitra painting. 6. ISKCON’s Harinama Mandir in Czech Republic. 7. Vrindavan, in a small temple right across from Gopala Bhatta Goswami’s samadhi, twenty meters down the street from the entrance to the Radha Ramana temple. 8. Jagannath Puri, Odisha. Sarvabhauma Bhattacharya’s house. 9. A painting by modern artist Alimpan from Kolkata. 11. BBT painting by ISKCON artist Pushkara Dasa. 12. Popular Bengali folk painting sold in the streets of Nabadwip.